Create a dining space that highlights contemporary sophistication with this chic dining set. The table features a unique pedestal base and clean lines for a modern minimalist look. 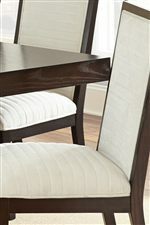 Upholstered chairs in a beige chenille fabric complete the set, providing comfort and continuing the contemporary feel with a stark contrast in color and sleek tapered lines. The Antonio Contemporary Dining Set with Upholstered Side Chairs by Steve Silver at Walker's Furniture in the Spokane, Kennewick, Tri-Cities, Wenatchee, Coeur D’Alene, Yakima, Walla Walla, Umatilla, Moses Lake area. Product availability may vary. Contact us for the most current availability on this product.